The Blas F. Ople Policy Center, a non-government organization that assists distressed OFWs, will hold its 5th Annual Happy OFW Christmas party with the theme: “Celebrating Change!” on the 13th of Decemeber at the Ramon Magsaysay Auditorium of the SSS Building in Quezon City. Families of overseas Filipino workers will have a chance to create their own Christmas cards for President Rodrigo Duterte during this event. The activity will serve as venue where OFW families extend their private messages for the president who they refer to as “Tatay Digong”. Messages will be signed, sealed and delivered to the Office of the President according to the center president, Susan Ople. Among the moves which endeared the president to his constituent OFWs are ending the tanim-bala scam, ensuring tax-free balikbayan boxes, and creating regional one-stop OFW processing centers throughout the country. The annual Pusong OFW Awards will also be given during the said event. Six leaders will be chosen by the center staff and volunteers based on their track record in advancing the cause and welfare of OFWs. This year’s awardees are Senate President Aquilino “Koko” Pimentel III, Labor Secretary Silvestre Bello III, former Vice-President and broadcaster, Noli “Kabayan” de Castro, Quezon City Mayor Herbert Bautista, former OFW Francisco “Jun” Aguilar of the Filipino Migrant Workers’ Group (FMWG) and OFW advocate Luther Calderon of Kabalikat ng Migranteng Pilipino, Inc (KAMPI). Pimentel fought with the OFWs against Memorandum Circular No. 8 issued by the Manila International Airport Authority under General Manager Angel Honrado citing its violations of existing laws that grant exemptions to OFWs from paying the P550 terminal fee. Bello for his part is recognized for his prompt action within the first 100 days of the Duterte administration to address unresolved issues concerning the unpaid salaries of over 10,000 stranded OFWs in Saudi Arabia. He personally went to Saudi Arabia to assess the urgency of the situation and helped thousands of OFWs to come home. 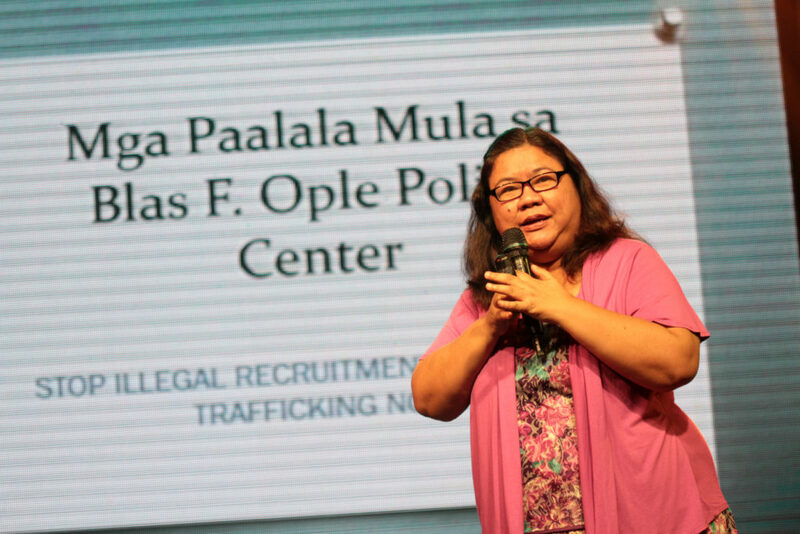 Noli de Castro warned through mass media about Ozmando Hibalag, a large-scale illegal recruiter who victimized over 200 job applicants victimizing applicants mostly from Davao City. Quezon City Mayor Bautista is being cited for the work of his Public Employment Service Office in attending to the needs and concerns of OFW constituents.